I don’t often make pavlovas as they end up being too big for a few people to eat, and all those calories over a few days is not a good idea! But a couple of friends came round to see us on Fri so I made one and it was luuuuuush! 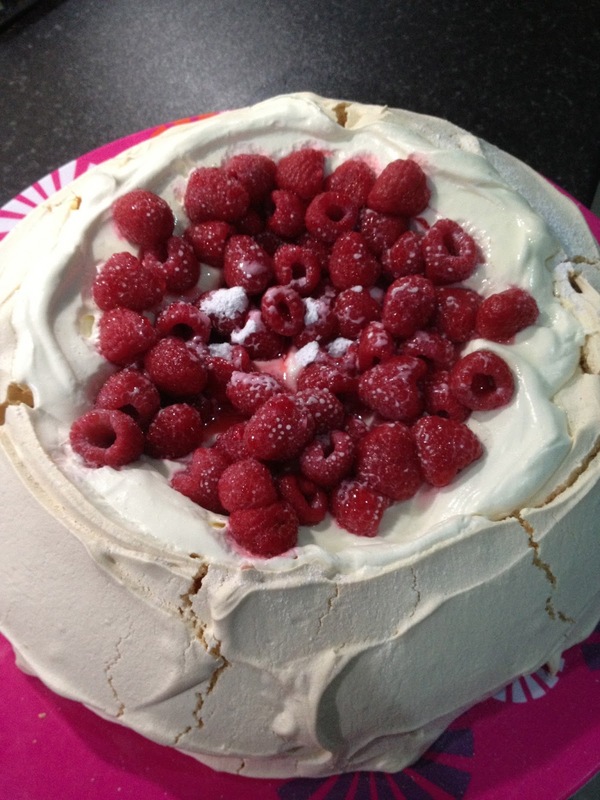 I prefer to keep my pavlovas simple, no crunchy, pippy passion fruit toppings for me thank you very much! So this recipe can pretty much be thrown together out of store/fridge/freezer staples and looks like you’ve made a huge effort. Result! The rule of thumb you need when making a pavlova is 62.5g of caster sugar per egg white, this way you can make one as big or small as you like! Preheat the oven to 160 degrees. Begin by whisking the egg whites until they form stiff peaks in a free standing mixer. With the motor running, add the sugar a tablespoon at a time until thoroughly incorporated. Add the vinegar and cornflower and mix in well. Spoon the meringue on to a lined baking sheet. I usually take care to make a well in the middle with banked up sides to hold the filling in place but you can do it however you wish! Pop into the oven and turn the heat down to 140 degrees. Cook for 90 minutes and then turn off the oven. Leave the door open a little and leave the pavlova to cool in the oven. 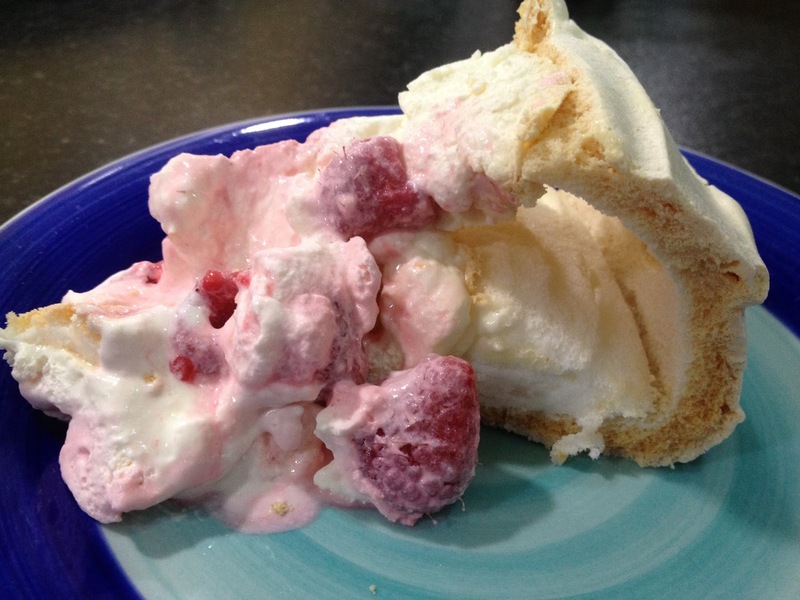 Whip the cream to soft peaks then spread onto the pavlova. Add the raspberries and then sift over the icing sugar. Utterly delicious! 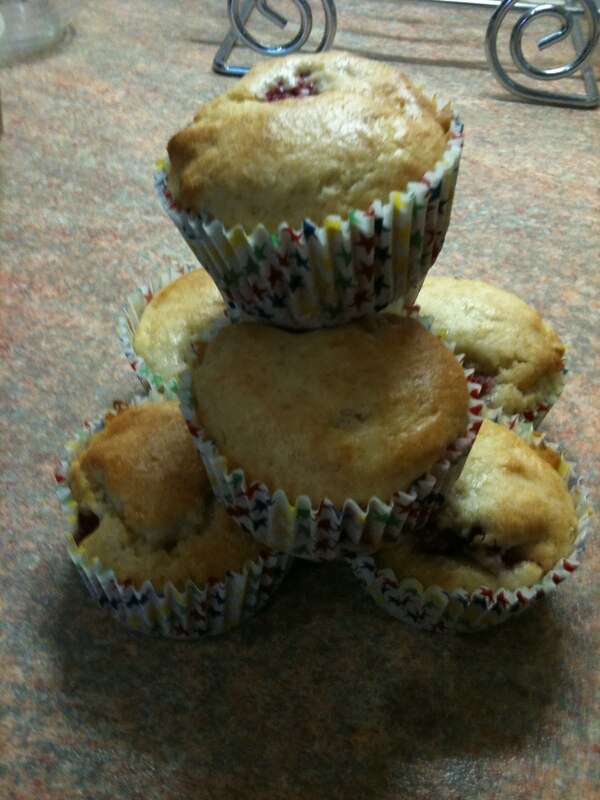 The original recipe for these is on the BBC Good Food site. I have simply added vanilla to them. Melt the butter and allow to cool. Combine all the dry ingredients in a bowl and mix. Add the chocolate and raspberries and then the egg and milk and finally the butter. Mix lightly. Scrape into lined tins and bake at 160 degrees for about 15-20 mins till golden brown. Delicious! This is from November’s BBC Good Food Magazine and it’s to DIE for. Seriously. It’s really, really gooooooooood! Line a tart tin with the pastry, prick and bake in a hot oven for 10 mins till lightly coloured. Meanwhile lob everything else (apart from the jam and flaked almonds and raspberries) into a bowl and mix well to make the spongey topping. This is _yet another_ Hummingbird recipe, but oh MY! it’s good! I made it for a work fuddle and it went down a storm. Begin by making the brownie base. Melt the chocolate. Beat the butter and icing sugar together and then add the flour a dollop at a time. 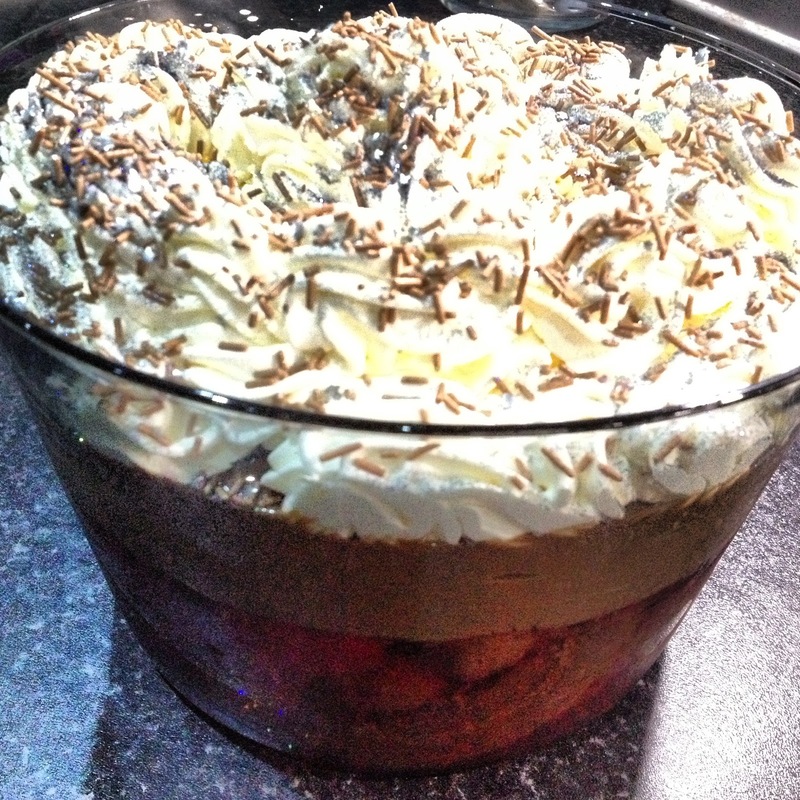 Mix in the chocolate and splat into a lined baking tin. Whisk together the cream cheese and icing sugar and eggs and vanilla. Pour over the brownie base. Bake in a moderate oven for about 30 mins. Once cooked, leave to cool and then chill in the fridge. Just before serving whip the cream and raspberries till very thick and fluffy. Smear on to the cooked base and then sigh in pleasure as you devour each. Little. Bite. Utter, utter bliiiiiiiiis! This is based on Rachel Allen’s recipe for Dutch Apple cake and her variation for adding pears and raspberries. Begin by whisking the sugar and eggs together till thick and frothy. Meanwhile melt the butter with the milk and then slowly whisk in to the egg mixture. Add the flour, baking powder and orange rind. Pour in to a lined baking tin. Lay the pears and raspberries on the top. Bake for 10 mins at 200 degrees then for a further 30 mins at 180 degrees. Mix the jam with the OJ and then add the berries and mix gently. Whip the cream till billowy. 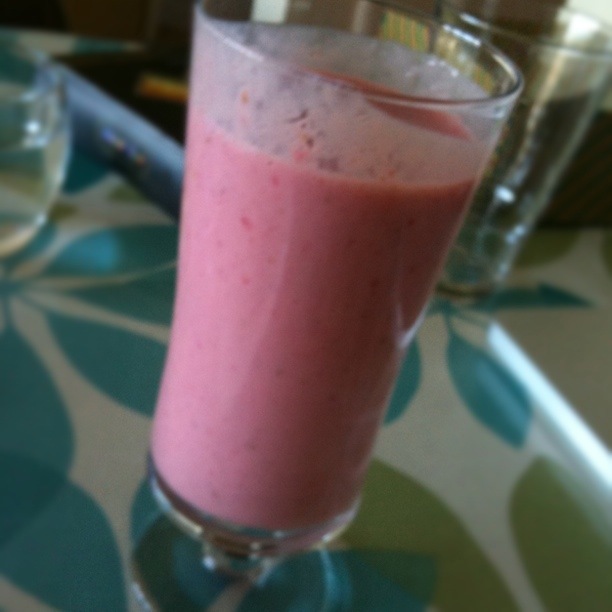 Layer some berries in the bottom of serving glasses and then add 1/4 of the custard. Add some more berries and then finish with a dollop of cream. Serve soon after assembling or it’ll meld in to a gooey, but yummy, mess. Yes, highly original this recipe, but I think it’s actually better than it’s plain and purer sister. The addition of raspberries gives you something to contrast the rich chocolate with and the creme de cassis adds a different dimension to the rum. Melt the chocolate, glucose and booze together in a double boiler. Meanwhile sprinkle the ammoreti crumbs over the base of a springform tin lined with clingfilm. Lay about 15 raspberries on to the base of the tin, on top of the crumbs. Whip the cream till flopped and then fold into the chocolate mixture. Add the rest of the raspberries, saving 12 for decoration, and fold gently to mix. Pour in to the tin, smooth the top, dust with cocoa and decorate with the reserved raspberries. Leave to chill for at least a couple of hours, if not overnight. Serve in modest slices and let out a deep sigh of contentment. Someone tasting this yesterday said “do you always eat like this” to my husband and looked very jealous at the positive reply!! This is based on a recipe in Good Foods 101 Cakes and Bakes. Begin by making the cake. Cream together the butter and sugar, then add the eggs, lime juice and rind, flour, ground almonds and a little milk if necessary to make a smooth but thick batter. Fold in 2/3 of the fruit and scrape into 2 lined loaf tins. Scatter over the rest of the fruit and the flaked almonds. Bake in a moderate (150 degrees) oven for about 45 mins. Meanwhile make the syrup – gently heat the juice and sugar til the sugar has dissolved. Once the cakes are cooked, prick with a cocktail stick and pour over the syrup. Allow the cakes to cool completely before cutting into slices and enjoying.